Letterman Emmy-winner Ted Greenberg stars in the mostly-one-man comedy show Ted Greenberg’s The Complete Performer. Every first Saturday night of the month at the SoHo Playhouse in downtown Manhattan, Greenberg performs his outrageous, hysterically funny comedy and then whisks a lucky audience member home in a New York City taxi driven by Greenberg himself. 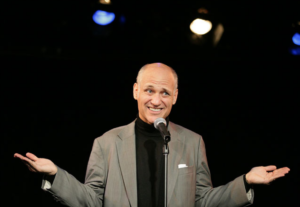 Now in its 10th smash season at the landmarked SoHo Playhouse Theater, Ted Greenberg’s The Complete Performer is perfect for date night, birthday parties or an evening out with your best friends. Learn more about Ted Greenberg’s The Complete Performer at the show’s website.